THROW AWAY YOUR BORING ICE TRAYS AND CHECK OUT THE NEW WAY TO COOL YOUR BEVERAGE!! ALL YOU NEED IS SIMPLY THE BEST ICE BALL MAKER THAT WILL BE THE NEXT BIG HIT AT YOUR PARTY!! - Perfect gift idea for friends, family, birthdays, father’s day, St. Patrick’s Day, Christmas & more! 100% SATISFACTION GUARANTEE! - Your satisfaction is our #1 goal. If you’re not happy, we’re not happy! If we can’t make it right and you’re not satisfied for any reason we will gladly and promptly give you a full refund within 30 days. No questions asked! THE MOST COST-EFFICIENT: XXL-size 4 x 4.5 cm (1.78 inch) Sphere Ice Ball Tray is designed for optimized freezing duration and long-lasting ice balls! 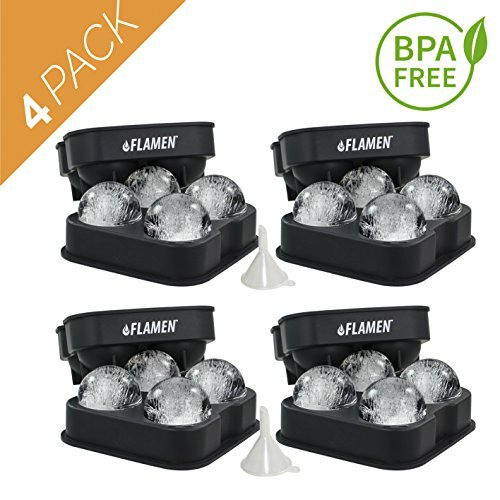 Our ORIGINAL FlamenTM Ice Balls are ultra-slow melting ice spheres. DISHWASHER SAFE: Easy to fill, Easy to use, Easy to clean. Simply toss the ice ball maker tray in the dishwasher for an easy and convenient clean. PERFECT GIFT: Our Ice Ball Maker brings sparkles and fun to every Pool party, Garden party, After-Dark party, in the wine cellar and any other event! 100% GUARANTEED PRODUCT! If you have any questions about this product by Flamen, contact us by completing and submitting the form below. If you are looking for a specif part number, please include it with your message.